I’ve got some happy, sad, and generally-feelingsy news to share. 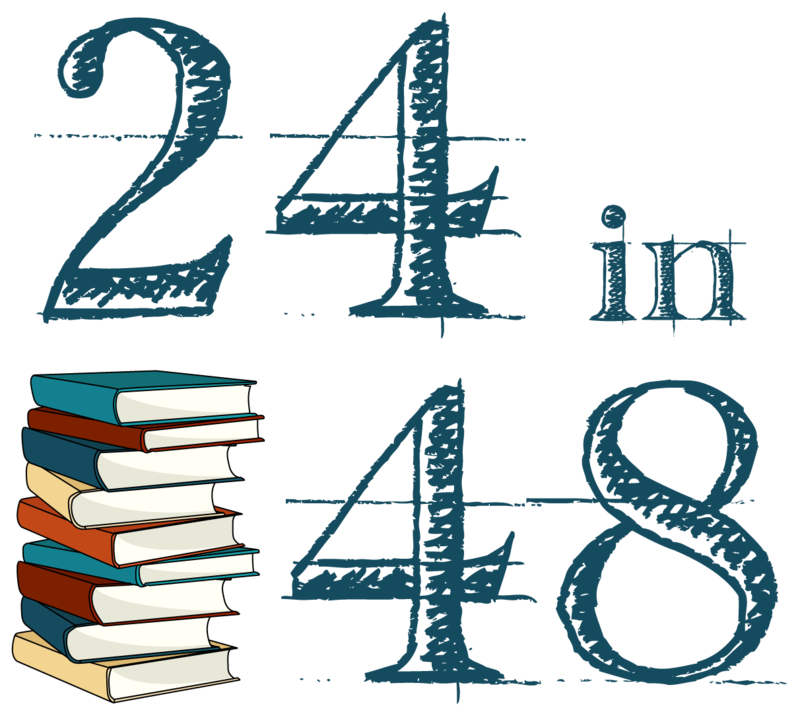 We’re at hour 42, which means you’ve done the damn thing almost all the way through, AND that we’ve reached our last challenge for this edition of 24in48. I’M HAVING COMPLICATED FEELINGS, OK? Mostly, though, I’m glad you’re here. I’m glad you joined us. I’m eternally grateful for this event, my cohosts, and every single one of you readers the world over. Whether you’re cramming through those last few hours to hit your goal, finish that book, or just generally see this thing through to the end, we know you’re here to celebrate the winners of our Hour 30 challenge before we dive into the last challenge. You know the drill! If you won, get thee to the prize page to stake your claim! AND NOW: THE LAST CHALLENGE. This time around, we want to see the first book on your shelves, and the last book on your shelves. I’m always intrigued by the way readers choose to organize their shelves, if at all. Overall, I break things down by Fiction and NonFiction. Within that, I separate hardcover and paperback, and then alphabetize by author. Now, show me yours. Tell me how you organize. Cry about how you’ll never find the beginning of your stacks of books and will ultimately be buried under the weight of them because you can’t stop buying more. You know. You do you. If you’re posting a photo of your entry on social media, don’t forget to use the official hashtag #24in48 so other readers can find you, and tag us so we can see! We’ll post the winners of this challenge in six hours (Hour 48, the very end of 24in48), so make sure you check back after you entered to see if you won! Hour 39: Keep On Keeping On! We have nine hours left to go in this amazing weekend of readerly love, and I’m here to make sure you keep on keeping on! I (Kerry) for one tend to get a little run down round about this time every readathon, but that’s ok! Some snacks, a quick walk break, a new book — it’s all about finding new ways to keep energized. What are you all reading right now? What’s keeping you going? Share your tips and advice, and be sure to keep tagging your posts with the #24in48 hashtag so we keep seeing them! It’s not too late to enter the Hour 36: Childhood Reads challenge, either. What are you waiting for? Sweet, sweet midday on day two of 24in48. If you’re following the official timeclock, it’s noon (EST) on day two, and it’s the time when you need the most motivation. We’re 3/4 of the way through this thing, and it’s time to caffeinate, nap, hydrate, take a walk, splash some cold water on your face—whatever you need to keep going. Head on over to the prize page to stake your claim! And now, it’s time to walk down memory lane. What’s the oldest children’s book you have, or a book you’ve held onto since your childhood? Share it with us! Every reader I’ve met has strong childhood memories of devouring every book they could get their hands on, but there are some that stick out among the sea of books. I’ve got a battered copy of The Westing Game on my shelf that I’ll never be able to part with, in addition to a well-loved-cover-falling-off copy of Little Women that belonged to my mother before me. If you’re posting a photo of your entry on social media, don’t forget to use the official hashtag #24in48 so other readers can find you, and tag us so we can see! We’ll post the winners of this challenge in six hours (Hour 42), so make sure you check back after you entered to see if you won! Carving out time to read all weekend is no easy task for many of us; it means setting aside any number of other things to prioritize, as much as possible, books, reading, and the reading community. And that is incredible, whether you read for one hour or all twenty four here. So three cheers for that, each and every one of you. We’ve got 15 hours left to go in this thing, and I know you’re all crushing it.